The low Tudor arch was a defining feature. Some of the most remarkable oriel windows belong to this period. Mouldings are more spread out and the foliage becomes more naturalistic. 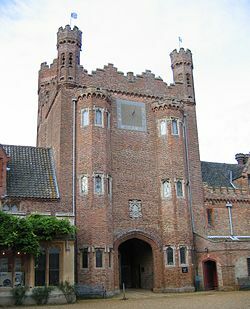 During the reigns of Henry VIII and Edward VI, many Italian artists arrived in England; their decorative features can be seen at Hampton Court Palace, Layer Marney Tower, Sutton Place, and elsewhere. However, in the following reign of Elizabeth I, the influence of Northern Mannerism, mainly derived from books, was greater. Courtiers and other wealthy Elizabethans competed to build prodigy houses that proclaimed their status. Though this period is better known for the luxuries and excesses of his son and granddaughter, it was actually under Henry VII that the transition from the Middle Ages to the Renaissance began and it is often underestimated how much effort the founder of the Tudor dynasty invested in making huge changes to the way things were done before versus the way they were being done by the time he died. Prior to 1485, many wealthy and noble landowners lived in homes that were not necessarily comfortable but built to withstand sieges, though manor houses that were only lightly fortified, if at all, had been increasingly built. Castles and smaller manor houses often had moats, portcullises and crenelations designed for archers to stand guard and pick off approaching enemies. However, with the arrival of gunpowder and cannons by the time of Henry VI, fortifications like castles became increasingly obsolete. The autumn of 1485 marked the ascension of Henry VII to the throne. Until Henry's accession, England had been engaged in the Wars of the Roses that had left the royal coffers in deep trouble-Yorkists had raided the treasury just after the death of Edward IV. Therefore, in 1487, Henry Tudor passed laws against livery and maintenance, which checked the nobility's ability to raise armies independent of the crown, and raised taxes mightily on the nobility through a trusted advisor, John Morton. Henry Tudor was hellbent on repairing the damage done by so many years of war, and that meant increasing financial security. It also meant recentralising power in London with the crown alone and away from interrelated nobles who had been squabbling over scraps of power since the reign of Richard II, evidenced by the crown beginning to be fought over by different branches of the descendants of Edward III at that time. From Henry's point of view, there were taxes to collect, bills of attainder to hand out to the disloyal, Yorkists to marry off to Lancastrians, the majesty of the monarchy to repair and restore, and a metaphorical wrecking ball to be applied to the medieval ideal of the warrior king crouching in his fortress and his vassals in theirs. During the reign of Henry VII, he made some savvy business investments in the alum trade and made vast improvements to the waterborne infrastructure of the country: the site of his dry dock in Portsmouth still is used today, and equally because of Henry's investments in alum (a mordant used for dying wool, a major export of England at the time) records also show a striking increase in the volume of ships and thus trade coming in and out of England. Portsmouth was an early pet project of Henry VII, one he paid approximately £193 for the entire construction, a sum that for its time was enormous. It must be note that not all Tudor architecture was of a residential nature, and this particular one is very important as it laid the foundation for other civic projects done under Henry VIII and Elizabeth I. Henry Tudor built the very first dry dock in the world at this site. It was a big leap forward from what was available during the Medieval period: for most of the period ships were poorly suited to trade that reached any farther than just off the coast and were no match for the turbulence of waters like the North Sea let alone crossing the Atlantic. Within three years of Henry Tudor's ascension to the throne, however, Bartolomeu Dias had rounded the future tip of today's South Africa and by doing so would change the world forever: he opened up a sea passage to Asia and opened a route that completely cut out the reliance on the Silk Road and the Turks who controlled it. Ships were beginning to get faster and more capable of much longer journeys. Patronage of explorers would be a theme of the rest of Henry's adulthood, and it behooved him to take advantage of having the only place in all of Europe that could repair ships, build new ones, remove barnacles and shipworms, and break up and recycle older ships. Purchasing eight acres, he handed off the job of constructing it to a trusted councillor Sir Reginald Bray with the final construction, according to a 17th-century tome, measuring 330 feet on each side, the bottom of the dock 395 feet long, and the whole 22 feet deep. The wharf on the outside of the piers that marked the dock's location were 40 feet on each side at a depth of 22 feet. Henry VII and the dock operated by swinging some hinged gates open, allowing the ship to enter, and then water was taken out with a bucket and chain pump worked by a horse-gin. Further combinations of new laws, government reform, increased amounts of money pouring into the nation, new businesses opening up for a newly minted merchant class that was finally free of the last remnants of feudalism, and a much modernized exchequer opened the door to a boom period for England. Wealthy homes could be built for material comfort and aesthetics rather than as imposing stone citadels and for arts and humanities to take more precedence over battle axes. In the early part of his reign, Henry Tudor favored two sites, both on the River Thames though in opposite directions, with one west of Westminster and one east of it. Upon his rise to power he inherited many castles, but notably he did very little to these. Recent evidence suggests that he made notable improvements to other properties belonging to the crown, including Greenwich Palace, also known as the Palace of Placentia. Although today the Old Royal Naval College sits on the site of the palace, evidence suggests that, shortly after ascending the throne, Henry spent a very large amount of money on enlarging it and finishing off a watchtower built prior to his reign; his Queen, Elizabeth, gave birth to Henry VIII and his brother Edmund in this palace. Henry Tudor's palace facing the Thames Estuary would have had a massive brick courtyard that faced the River Thames and commanded a view of the ships passing by. As of 2018 archaeological digs continue and much has been discovered regarding the kind of palace Henry (and later his son) invested so much money and time into. For example, recent archaeology suggests that Greenwich had "bee boles": these were found in the basement of the palace and were little nooks in which beehives were kept during winter when honeybees hibernate. They would be taken out to provide for the king's table in spring and they are numerous, suggesting the desire for grand amounts of entertaining. Surprisingly, much of the remains beneath the royal college reveal an edifice built with brick, not stone: castles in England going back to the Normans had been built with stone, never brick, hence this is an early advancement in technology and style and given its load bearing position at the bottom of the building it is extremely unlikely to have been erected under the aegis of any later monarch. It is also believed he added a sizeable chapel to the grounds with black and white tiles, discovered in 2006. Sheen, was someway down river from (and in the present day part of) London and became a primary residence as Henry's family and court grew larger. This had been one of the royal palaces since the reign of Edward II, with the most recent additions as at 1496 being by Henry V in 1414. The building was largely wooden with cloisters and several medieval features, such as a grand central banqueting hall, and the Privy Chambers facing the river very much resembling a 15th-century castle.. This burnt to the ground at Christmas 1497, with the royal family in residence; accounts of it made by a foreign ambassador to the court describe a catastrophe so big in magnitude that it nearly killed the king himself. However, within months Henry began a magnificent new palace in a version of Renaissance style. This, called Richmond Palace and now lost save for some fragments, has been described as the first prodigy house, a term for the ostentatious mansions of Elizabeth's courtiers and others, and was influential on other great houses for decades to come as well as a seat of royal power and pageantry of an equivalent of modern day Buckingham Palace or the 18th century St. James's Palace. Detail of Georg Hoefnagel's 1568 watercolour of the south front of Nonsuch Palace. This is the way it would have looked early in the reign of Elizabeth I.
Henry VII was succeeded by his second son, Henry VIII, a man of a very different character of his father, who spent enormous amounts on building many palaces, most now vanished, as well as other expensive forms of display. In a courtyard of Hampton Court Palace he installed a fountain that for celebrations flowed with wine. He also built military installations all along the southern coast of England and the border with Scotland, then a separate nation. Henry VIII's most ambitious palace was Nonsuch Palace, south of London and now disappeared, an attempt to rival the spectacular French royal palaces of the age and, like them, using imported Italian artists, though the architecture is northern European in inspiration. Much of the Tudor palace survives at Hampton Court Palace, which Henry took over from his disgraced minister Cardinal Wolsey and expanded, and this is now the surviving Tudor royal palace that best shows the style. As time wore on, quadrangular, 'H' or 'E' shaped floor plans became more common, with the H shape coming to fruition during the reign of Henry VII's son and successor. It was also fashionable for these larger buildings to incorporate 'devices', or riddles, designed into the building, which served to demonstrate the owner's wit and to delight visitors. Occasionally these were Catholic symbols, for example, subtle or not so subtle references to the trinity, seen in three-sided, triangular, or 'Y' shaped plans, designs or motifs. Earlier clerical buildings would have had a cross shape so as to honour Christ, such as in Old St Paul's and the surviving York Cathedral, but as with all clerical buildings, this was a time of great upheaval catalyzed by Henry VIII's Reformation. A part of his policy was the suppression of the monasteries and several examples of the Middle Ages today lie in ruins because of the nobility raiding the properties for building materials, gold, and anything of monetary value: for many the only way to escape being destroyed was the monarch holding a personal interest in keeping the abbey or cathedral intact (Westminster Abbey being an excellent example.). 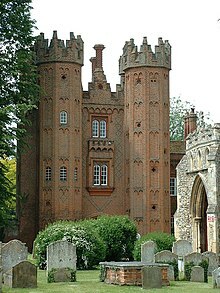 One of the most famous examples of this lies in East Anglia, near the village of Walsingham. Predating the Norman Conquest, this area of the present day United Kingdom was a major site of pilgrimage dedicated to the Virgin Mary, the mother of Christ. Over the centuries an Augustinian priory was erected upon the site that grew wealthy from pilgrims' donations and for its era this one of the most popular shrines in all of England: Monarchs from Henry III-Henry VII had worshipped at the place by 1510, and even men as famous as Erasmus visited. 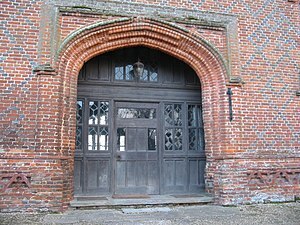 During Henry VIII's Reformation, however, the records show that the monks at Walsingham were turned out into the streets, the priory chapel was desecrated, and the gold and silver ornamentations of the architecture were looted. Illuminated manuscripts were burned. The statue of Our Lady of Walsingham at the center of the shrine was brought back to London as a trophy to be destroyed, and the property itself was turned over to a man in the king's favour whereafter it was mined for its stone. The great majority of images, and elements of church furniture disapproved of by the Protestants, were destroyed in waves under Henry VIII, Edward VI, and later during the English Commonwealth. For example, during the reign of Edward VI parishioners witnessed a royal decree ripping out the rood screen in every single church: none of these now survive and in addition many altarpieces were burned. While Henry VIII was still alive, many statues and shrine objects were smashed or burnt: they were considered "abused images" and a form of idolatry by many aligning with the king. Building of new churches became much less frequent, and as a result England actually has larger numbers of medieval churches whose main fabric has survived than most parts of Europe. Tragically, however, larger buildings like Jervaulx or Fountains, buildings whose wealth and grandeur were meant to rival Notre-Dame de Paris often do not even have their stained glass windows and are a shadow of their former selves. Outhouses in the back of the home, especially beyond cities in market towns. Flushable toilets were centuries away for the middle classes and in some less common cases they would not move indoors completely until the second half of the 20th century. Little landscaping behind the home, but rather small herb gardens. Occasionally bee skeps would be kept in this area as a means of getting wax for candles and also, when in season,honey. The poorest classes lived in hovels, a building with a slightly different definition than today: it was a one-room wattle-and-daub hut. Most did not have the copyhold on the land they occupied and were tenants on another man's land; amenities were very basic in that there was a place to sleep, a place to eat, and a place to cook. Tudor architecture remained popular for conservative college patrons, even after it had been replaced in domestic building. Portions of the additions to the various colleges of the University of Oxford and the University of Cambridge were still carried out in the Tudor style until the middle of the 18th century, overlapping with the first stirrings of the Gothic Revival. Chisholm, Hugh, ed. (1911). "Tudor Period" . Encyclopædia Britannica. 27 (11th ed.). Cambridge University Press. p. 363. ^ a b c d Picard, Liza (2003). Elizabeth's London. London: Phoenix. ISBN 978-0-7538-1757-5. ^ "King Henry VII - The Accountant King". ^ Curry, Ian. "Henry the Accountant – was there more to Henry VII? – Vaguely Interesting". ^ "1495 - Worlds First Dry Dock - Portsmouth Royal Dockyard Historical Trust". portsmouthdockyard.org.uk. Retrieved 5 June 2018. ^ "The traces of the Tudor palace at Greenwich are a truly remarkable find | Apollo Magazine". Apollo Magazine. 30 August 2017. Retrieved 4 June 2018. ^ Daley, Jason. "Part of Henry VIII's Birthplace Discovered". Smithsonian. Retrieved 4 June 2018. ^ "Henry VIII's Lost Chapel Discovered Under Parking Lot". news.nationalgeographic.com. Retrieved 4 June 2018. ^ "Richmond Palace" (PDF). London Borough of Richmond Upon Thames. ^ "BBC News - Henry VIII replica wine fountain unveiled". ^ Pragnall, Hubert (1984). Styles of English Architecture. Frome: Batsford. ISBN 978-0-7134-3768-3. ^ Airs, Malcolm (1982). Service, Alastair (ed.). Tudor and Jacobean. The Buildings of Britain. London: Barrie and Jenkins. ISBN 978-0-09-147830-8. ^ Aston, Margaret (26 November 2015). Broken Idols of the English Reformation. ISBN 9781316060476. ^ a b Quiney, Anthony (1989). Period Houses, a guide to authentic architectural features. London: George Phillip. ISBN 978-0-540-01173-5. ^ Eakins, Lara E. ""Black and White" Tudor Buildings". Tudorhistory.org. Retrieved 12 March 2014. ^ "About us". Tudor Barn Eltham. Retrieved 12 March 2014. Tudor Barn Eltham is all that remains of the country mansion that was built for William Roper and Margaret More, daughter of Thomas More, Lord Chancellor to Henry VIII[,] and is surrounded by a medieval moat and nearby scented gardens. The venue is situated in thirteen acres of beautiful award winning gardens and has stood on this ancient site, which is connected historically with the Tudor Monarchs´ residence at nearby Eltham Palace, since 1525.